There's a scene in Blindspotting when a man suddenly recognizes the main character, Collin, and begins telling his friend about the crazy night several years ago when Collin fought a hipster in the street. Collin was a bouncer, and the guy tried to bring his flaming drink outside to show off, and in the ensuing tussle they both end up catching on fire. Through the onlookers eyes (and ours as the audience), it's hysterically funny, arguably the funniest scene in the movie. Then, on a dime, Collin's ex interjects to explain that the hipster was hospitalized and Collin was sent to jail for two years, and although we're seeing the exact same scene of a two men fighting while on fire, it is no longer funny, but frightening and upsetting. This is Blindspotting, perfectly exemplified: a personal story that touches on all kinds of issues in a very serious way, but manages to balance that with somehow also being maybe the best comedy of the year so far. Directed by Carlos López Estrada, the film stars its two co-writers Daveed Diggs and Rafael Casal as Collin and Miles. When Blindspotting opens, Collin is living out his last few days on probation and trying to avoid getting into trouble, no easy feat considering that Miles, his best friend and co-worker, is always eager to play the thug, purchasing a gun on a whim in his first scene. Collin witnesses a police officer killing a black man on the street as he drives home one night, and this event, along with the encroaching gentrification of their Oakland neighborhood play pivotal roles in the day-to-day lives of these two men and their families. 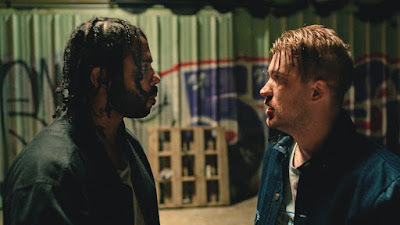 The most impressive thing about Blindspotting is its ability to tell a tight 95 minute story that intelligently comments on complex issues like gentrification, racial identity, police violence, gun safety, and a felon's re-entry into society. It tackles these ideas head on, and is incredibly genuine without ever feeling like a straight morality tale. As Diggs says of the film, these are things that people have to deal with in their daily lives, so it only made sense for all those ideas and concepts to play a role in their personal stories. Both Collin and Miles are struggling with how people see them. For Collin, he worries that his ex, Val (Janina Gavankar), can only see him as the guy who brutally beat a man and landed himself in jail, that on paper he is viewed as nothing more than a convicted felon, and to the police nothing more than a target. Miles on the other hand, gets away with far more egregious actions oftentimes just because he's white, but he struggles with the fact that he doesn't want to be confused with the white hipsters that have begun taking over their neighborhood, and is constantly out to prove that he's harder than everyone else. The screenplay is brilliant, especially in how all these ideas are introduced naturally as the story progresses and are gradually and fluidly brought to the forefront in the incredibly tense climaxes of the film. It never feels like the conflicts come out of nowhere or are forced on the characters; rather they evolve as a matter of course out of Collin and Miles' characters and the initial setup. Diggs and Casal wrote a super sharp script, but their performances deserve special recognition. Diggs is fantastic in the lead, giving Collin a quiet sort of frustration that simmers below the surface and explodes in one of the most memorable scenes in recent memory as he uses verse to express his righteous anger. Casal's performance as Miles is a revelation, giving a voice and a level of understanding to a character type that is extraordinarily rarely portrayed sympathetically. Blindspotting is also excellently edited and sound designed. This is especially evident in the surreal sequences in which Collin remembers the face of the man he saw get shot, something that pops in with fiery intensity, but that which Collin tries to ignore so he can avoid any contact with the cops while he's still on probation. There's also a phenomenal dream sequence that places him back in the courtroom in a way that balances real fears with more abstract ones. This is a movie you have to see, right now. It's as hilarious as it is powerful, as intimate as it is fundamental to a discussion of race in our country. In a Q&A after the film, Diggs noted that because these are things that so many people really deal with every day, they can't help but joke about them in the same breath that they mourn a friend who was killed. That sums up the beauty of Blindspotting: because the story it tells is such a critical one to the story of urban life, it manages to transcend the limitations of a single genre. I can't say enough good things about it. 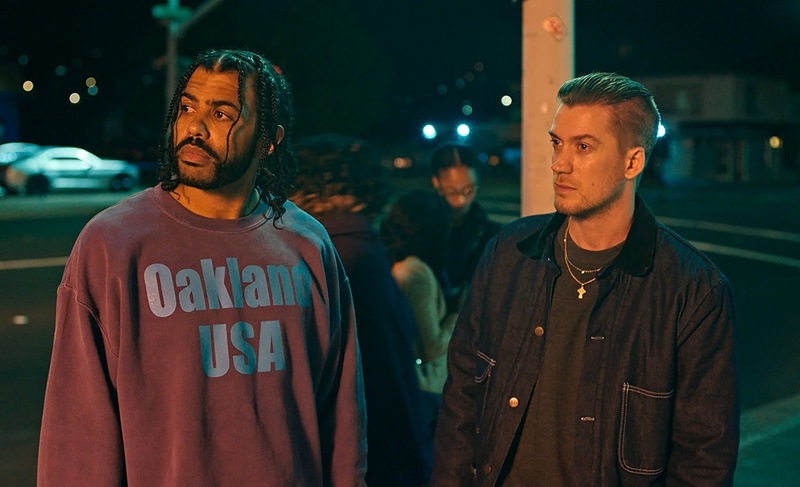 In short, Blindspotting is the best film of 2018 thus far. Blindspotting is directed by Carlos López Estrada, and stars Daveed Diggs and Rafael Casal, who also co-wrote the film. It is currently in the film festival circuit, but is set for release on July 27th.